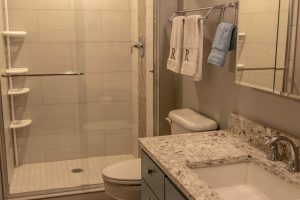 A well designed bathroom can create the perfect touch such as a stylish vanity in a powder room to beautiful spa- like walk in shower in the master bath suite. A bathroom should be remodeled at least every 10 years. The value of a home is reflected on the updates of a bathroom. A bathroom should function in a manner where you feel you have stepped into a private getaway. The layout, materials and fixtures should reflect the true meaning of a ‘rest room’. We are a very diverse firm specializing in Whole House Remodeling, Kitchen Remodeling, Home Additions and Garages. Bring your ideas or house plans and we will start with our signature design process. For this Victorian bathroom the client came to us with an extensive list of wants and wishes and a very clear vision for what she thought the project should look like. We poured over options and costs and came to the conclusion that simple was better, streamline was classic and her taste could stand alone! She wanted to highlight the marble top of her vanity and we spent days searching just the right one with the perfect amount of grey and crisp white to complement each other, and yet still look vintage. 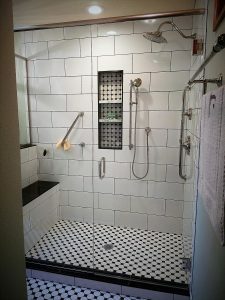 The black and white contrasting was the focal point of the shower, she wanted to feel like she was transported to a different time and place every time she took a shower. We wanted to create clean classic lines and getting the space usable was our priority for this project. Reconfiguring a walk in closet where there used to be two basic closets, while reusing some of the original closet storage. 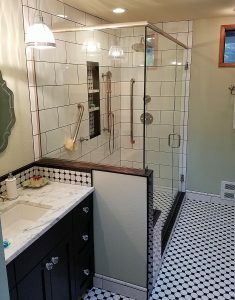 The update from the classic 1990s to what we now call a throwback to the Roaring Twenties was an absolute joy to do, from the reclaimed sliding barn door to the marble accents in the soap niches and the beautiful custom glass shower this entire project was timeless fun! We are a very diverse firm specializing in Whole House Remodeling, Kitchen Remodeling, Home Additions and Garages. Bring your ideas or house plans and we will start with our signature design process. 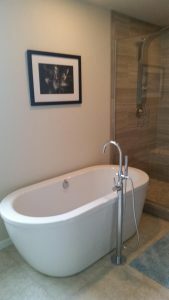 Learn more about our Bathroom Remodel Signature Process.